The Monkey Puzzle Montessori School 6-9-year Elementary programme will provide flexibility over several years and a smooth continuation of the Prep class learning experience. 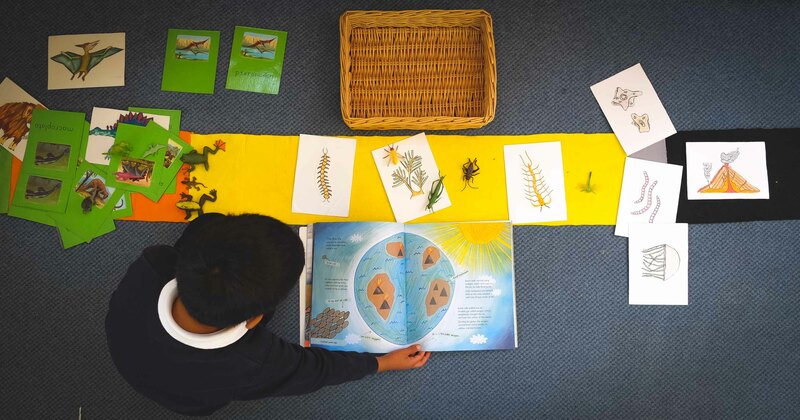 While the emphasis will be on following a Montessori Curriculum, all Key Stage 2 targets will be closely monitored and the children will be encouraged towards meeting all these requirements. Montessori underlined the importance of continuing to update the curriculum; we will follow developments in educational research and implement these when and where we feel necessary. What are the fundamental differences between a Montessori Elementary Class and a traditional primary school? Children have choices, there’s no ‘one-size-fits-all’ curriculum. Students are encouraged to be curious; they are engaged and love learning. The classroom is full of materials instead of textbooks and worksheets. Children learn to solve problems and think instead of learning repetitive, memorised information for optimum performance in standardised tests. Teachers gently direct the children within the prepared environment, rather than solely teach to groups. They individualise lessons and instruction to keep each child optimally challenged. The day has 2–3 hour work periods, instead of a schedule where activities are constantly changed. Children learn with and from each other in a mixed-age environment. Instead of competing, they grow into a community and practise all-important social skills every day. Autonomy is a huge factor in motivation and the Montessori Elementary curriculum enables children to have a say in their learning. Of course, each child must learn certain skills; mastering numeracy skills isn’t optional but instead of forcing each child to complete the same worksheet, the Montessori Elementary class ensures repetition by offering a variety of materials for practising a given skill and helping to encourage interest and understanding. For further information on our Elementary Curriculum please contact us.